Eight great foot tapping country styles, audience pleasers from easy listening to country bop. 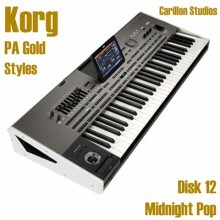 This is a selection of custom keyboard styles written by Carillon Studios. Each style is complete with intro's/endings/fills & variations. All styles are complete with STS settings and can be used for many different songs.